Join the Arizona Science Center for their 5th annual Girls in STEM Event Oct. 27–28, 2017 as we celebrate girls in science, technology, engineering, and mathematics (STEM). The event will be filled with learning opportunities centered around biology and biotechnology. The girls will meet and visit with women in STEM, and engage in a variety of hands-on collaborative problem solving activities throughout the evening and into the next day. The event is geared towards girls in grades 4–8. Adult staff and Women in STEM mentors will maintain a minimum of 1:15 ratio. Additional chaperones are welcome to attend at $20 per person. Dinner, snacks, and breakfast will be provided for attendees, mentors and paid chaperones. Click here to download the scholarship application. In a world where men largely outnumber women in science, technology, engineering and math careers, studies show that girls lose interest in these subjects as early as age eight. Arizona’s especially high demand for STEM talent is projected to increase 23 percent in the next decade. With only 25 percent of the female workforce currently employed in STEM-related positions, many women are missing out on higher paying and more rewarding employment opportunities that help them realize their full potential and contribute to the greater good. As one of its many programs designed to address this imbalance, Arizona Science Center has inspired girls to embrace science, technology, engineering, and math through a targeted annual event, Girls in STEM. Held on Friday and Saturday, October 27-28, approximately 150 girls in grades 4 to 8 collaborate with their peers to solve engineering-design problems and connect with women in STEM careers who enthusiastically mentor the young women. The goal of the event is to expose girls to interesting and engaging STEM-related activities and concepts that capture their curiosity and spark their interest in learning more. 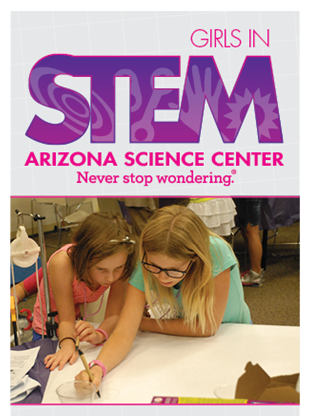 This and other programs that foster learning experiences for girls who are interested in the sciences have been an ever-increasing priority for Arizona Science Center since 2013. BECOME A MENTOR: Mentors will impact the girls in a variety of ways including helping with challenges, engaging the girls in different projects, and, most importantly, a chance to mentor and inspire young women to consider exciting careers in STEM. Mentors are needed Friday, October 27, from 6-11 p.m. or Saturday, October 28, from 6:30-10:30 a.m. Please visit azscience.org/events-programs/signature-events/girls-in-stem for more information or contact Tara Sonderman at sondermant@azscience.org with questions. Girls in STEM 2017 annual event is generously supported by APS, AT&T, Central Arizona Project, Herbert H. & Barbara C. Dow Foundation, Freeport-McMoRan Foundation, GoDaddy, Macy’s, SRP and WebPT.